It's been about two and a half months since Season Four of Lost ended, and I hope all of you have been making the most of the hiatus so far. For those of us who are in countries that have been enjoying warm-weather months since May 29th, I dare to guess that the time has gone by quickly. Besides, NO major non-reality TV shows have been on since Lost's finale, so it's not like anyone feels like they're missing anything just yet, right? However, when September and October bring a bevy of season premieres, things may get a tad more depressing and Lost's return in February will still be ridiculously far, far away. That's most likely why the producers of our favorite show once again threw us some bones to chew on during the recent Comic-Con conference in San Diego. I didn't attend the event, but have watched the video that was shown at the Lost panel, have thought long and hard about what it could mean, and am now fully prepared to provide a debrief. You all know my strict "no spoiler" rule for this site, but for some of the Comic-Con scoop, I make an exception. That being said, I'm not going to cover any of the Season Five plot-related information that the producers discussed in a question and answer session, although I did read all of it and don't feel that any of it is too surprising. If you would like to know what they said, the best and most succinct recap I have read is here. What I AM going to discuss, however, is the video that played. While I wasn't quite as excited about this one as I was about The Orchid Station video that debuted last summer, this clip probably raises just as many new questions, if not more. Before you watch it (assuming you haven't seen it already), allow me to set the stage. At Comic-Con, there was a Dharma Initiative booth, because the organization is apparently in business again and is trying to recruit new people (in the world of Lost, not in the real world... sorry, folks). A Lost fan attended one of the Dharma orientation sessions, and secretly filmed the video they showed there. Then he escaped from the room and showed the rest of the Comic-Con attendees what he had taped. This was obviously all just a staged thing with actors, lest you start getting too jealous of the kid on the tape. If you'd like to read a transcript of what you just saw, click here. Previously, Pierre Chang went by a different alias in each of the hatch orientation videos we've seen... and the names were connected: Marvin CANDLE, Edgar HalliWAX, Mark WICKmund. Now he has finally revealed his true identity. So did those other monikers hold any clues, or does this guy just like candles? And why did he feel he needed to use pseudonyms in the first place? We also find out that he is a professor from Ann Arbor, Michigan (Go Blue! ), the city where I spent four years of my life during college. Who else has ties to Ann Arbor, or "A-Squared" as we Michiganders say? The DeGroots. Remember them? 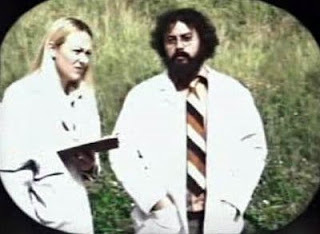 They are the two hippie freaks -- professors at the University of Michigan (in Ann Arbor) -- who co-founded the Dharma Initiative. The connection between Chang and the Degroots could've easily been deduced back in Season Two, when we saw them in the Swan Orientation video that Chang moderated, so what's the big deal? I personally think that Chang mentioned Ann Arbor to get us crazy fans thinking about the Degroots again... because I have a feeling they're going to factor into Season Five. I now put the probability of the Degroots being the Adam and Eve skeletons in the cave at 39.57% (higher than before). 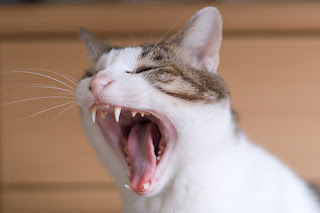 Honest-to-God truth: until I read the video transcript, I thought some rabid cat was making a racket at the start of Chang's speech. I felt really dumb after I found out it was supposedly a baby crying. They need to get better sound effects for these videos, seriously. So, the #2 Biggest Debate that has arisen from this new clip is: "Who is the baby?" Many people thought it was Charlotte at first, since we have been given reason to believe that she was born on the Island. We also know, from when Ben rattled off her background in "Confirmed Dead," that she was born in 1979, which would more or less fit the thirty-year time gap between when Chang shot the video and the present day (more on that shortly). However, Chang clearly says "take HIM outside," so I really don't think it's Charlotte. The next guess that's flooding the message boards is that the baby is Miles and is Chang's son... simply because he's Asian and so is Chang. Maybe Miles' "powers" come from the fact that he was born on the Island? I throw that theory out there, but I really don't subscribe to it, for the same reason that I don't believe Abaddon is "Older Walt" just because they're both African American. So right now, I have no intelligent guesses for who the baby might be. But I do think it might not even matter. Perhaps "Who is the baby?" isn't the question we should be asking. Perhaps the right question is, "HOW is there a baby on the Island?" Because, last we checked, pregnant women died before giving birth to any children conceived on the Island. The baby heard in the video could've been conceived elsewhere, like Aaron, and that is why he survived. Or maybe the problem with pregnant women arose after this video was taken. As I mentioned in my Season Four finale post: "But perhaps pregnant women started dying on the Island in the first place because of Ben... because he stopped devoting himself completely to the Island and got too wrapped up in Annie. As a punishment, the Island made it so that no one else could ever have children and Ben would have to bear the guilt of that situation." This we can be sure of: we were meant to notice the baby crying on that video for a reason, or else it wouldn't have been on the tape in the first place, nor would Chang have called attention to it. 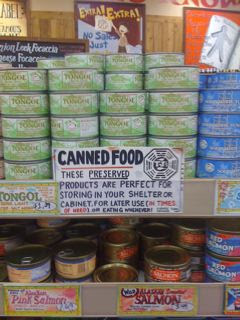 Finally, in Season Five we need to be on the look-out for a woman named "Lara," who Chang called out to on the tape. Some people think he said "Jennifer," but the actor who plays Chang actually confirmed the name was Lara in a recent interview (he says, "Dammit, Lara!"). We also learn that Chang was brought to the Island to conduct "experiments to study the Kerr metric solution of the Einstein field equations." Saaaaay whhhhaaaaat? According to Lostpedia, "the Kerr metric is used to describe the rotation of black holes and how everything, including light, must rotate when near a black hole. When the Kerr metric is applied to Einstein's theory of general relativity, we get a wormhole. Since the trajectory of observers and particles in general relativity are described by time-like curves, it is possible for observers in this region to return to their past. So, in theory, time travel is possible if one uses the Kerr metric." Now, where else have we seen mention of the Kerr metric on the show? 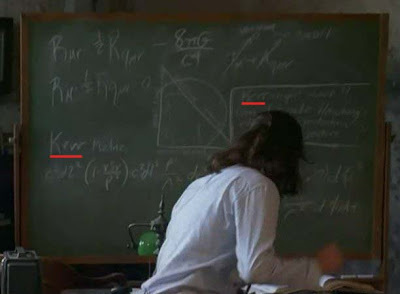 On the chalkboard in Daniel Faraday's experiment room in "The Constant." Who is/are the owner(s) of the voice(s) heard on the tape--the one or two people Chang speaks to near the end? When I heard the unseen guy say "None of that matters. It doesn't matter. Just get to it. Please! ", I (and pretty much everyone else who watched this video) thought, "Yay, it's Faraday!" How he says "please" was the giveaway. But then when I heard "This is useless! Alright? It's just useless. They'll never gonna see this, Pierre. How do I turn this off? ", I wasn't so sure. Concentrate on how this man says "off." It's a New Yorkish accent, and it definitely is not how Daniel sounds. This same person speaks again at the very end of the clip, and says "off" again, while Chang begs him not to shut down the camera. My initial hunch was that there were two men in the room with Chang. One is Daniel, who seems hopeful that the experiment might work. The other man is the more pessimistic one. Many people on the boards seem to think it may be Horace--the dude who brought Ben and his father to the Island, and who was seen recently in Locke's dream about Jacob's cabin. I could buy that, if for no other reason than it would explain why he popped up again on the show... they wanted to make sure we remembered him in future seasons. Further, the actor who plays Chang did confirm in an interview that "we have seen" the person who spoke on the tape. That seals the fact that it's not a new character. But it also leads me to believe it is just one person, rather than two, behind the camera (he didn't talk like there were two different people ... he used the term "the voice" in the interview). So, despite the weird-sounding pronunciation of "off," I think if I had only one guess as to who was in the room with Chang, it would be Daniel. It would explain why he was crying at the wreckage of Flight 815 when we first saw him in "Confirmed Dead" (though he appeared to have no understanding/memory of why he was upset). And Daniel obviously had a hunch he might be time-traveling one day, or else he wouldn't have noted in his journal that Desmond could be his constant. Just as important as the identity of the unseen man/men is how the guy(s) came to meet up with Chang in the first place. Because whoever the mystery man is, he is the one supplying Chang with information not only about the future, but also with more details than the Dharma group previously had about the mysterious properties of the Island. If we assume it is Daniel's voice in the video, then my guess as to how he got there would be that when Ben moved the Island, Tie Boy got thrown through time to a point in the past... which may or may not be the same point that Locke and others will have gone to. With his handy-dandy journal, Faraday would be able to help Chang figure out what is going on with the special space-time qualities on the Island, and then subsequently suggest an attempt at transmitting a message through a "pinhole" in time (the term Chang used on the tape). Why Daniel would sound so defeatist about the experiment working, however, is beyond me. I suppose if you thought you were going to be stuck in the past with a bunch of people who were doomed to die and didn't think you would ever see your lady love (Charlotte) again, you would be a bit exasperated. It does lead me to wonder, however, how Daniel would get back to the "present time" (for him, at least... which would be the end of 2004) after helping Chang try to reach the Future Dharma Team. Allow me to end this section with one note of caution. I remember being really taken aback at some of the comments I got, both on this site and on DarkUFO, about the "who's in the coffin?" debate that started after the Season Three finale. In one particular post, I had laid out all of the possibilities of whose casket it might be, and some people outright attacked me for not just accepting that it DEFINITELY WAS MICHAEL. It was a done deal in their minds. This confidence stayed with those commenters until the last five seconds of the Season Four finale. And, well... we all know how that one turned out. So I have to chuckle again when I read about all of these people who act like they have some sort of inside knowledge that it OBVIOUSLY IS FARADAY on the tape. While I agree that most signs point to it being him... I think we all should've learned by now that nothing -- absolutely nothing -- is a given on this show. Keep that in mind, should you find yourself ripping on anyone who doesn't think it's Daniel's voice, or being the subject of such taunts if you have another theory. Unless it is a still-shot from The Blair Witch Project, I have no guesses. Nor do I think it's important, I'm just reporting that others do. Although static drowns out exactly what Chang says about "thirty years," we can assume that since he made references to the Internet and the current President of the United States, and since he also spoke of a "violent purge" that had not yet happened, that he is coming to us from the year 1978, thirty years in the past. How does this fit in with the timeline that we think has been established for the show thus far? (I'm taking all dates from the timeline listed on Lostpedia, which pulls from either stated dates or implied dates within episodes). 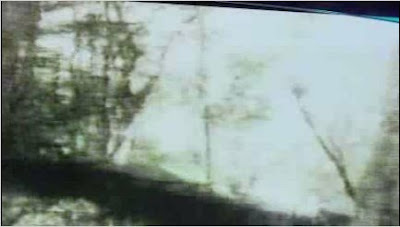 1978 - Chang broadcasts the video to the year 2008, possibly with the help of Faraday. Chang still has his left arm intact and there is at least one baby on the Island. 1980 - The Swan (original hatch) Orientation film is copyrighted, and in the video Chang's left arm is a prosthetic. The Pearl's Orientation film is also copyrighted in this year, but Chang's left arm appears to be his own in that reel. 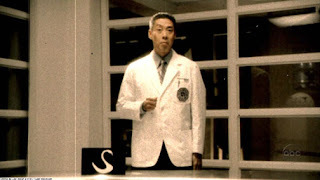 1992 - The Purge takes place, where Ben helps The Others kill the Dharma Initiative members with poison gas. 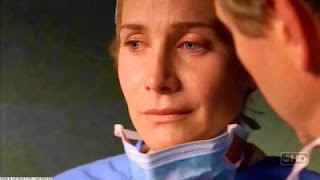 2001 - Juliet arrives on the Island, and at this point, the problem with pregnant women has been going on for some time. 2004 - Ben "moves" the Island. 2008 - Chang's video makes its way thirty years into the future. My guess would be that Chang must lose his arm in "the incident" he refers to in the Swan film. "The incident" was apparently why they started having someone push the button in the Swan hatch every 108 minutes in the first place (ah, remember the button and the Countdown Clock 'o Doom? Those were the days...) -- to control the Island's electromagnetic anomaly. So whatever this incident was, it probably happened between 1978, when Chang still had his arm, and 1980, when he appears to have a prosthetic in at least one video. Even though he mentions "a violent purge" while looking down sadly at his arm in this newest reel... his arm was obviously already gone before he was killed in The Purge. Who wants to bet that we're going to see Chang on the Island in Season Five (in the past)? Who wants to also bet that a lot of what happened between 1970 and 2001 is going to be covered in Season Five? Before the video is cut off, Pierre pleads with his unknown transmission recipients to "continue the research," to try to save him and his group, to try and find a way to "change the past," and to "stop what's about to happen." First and foremost, let me reiterate that the producers have said, literally countless times, that the futures we have seen for the Oceanic Six are set in stone -- they are not going to change. They admit that it would be "cheating" and that the audience would not have any stake in the characters if it wasn't certain that Jack, for example, would end up all depressed with a hillbilly beard after returning home. So any talk of theories that include some group going back in time to change the past that will therefore make a different future unravel for our Lostaways should be ignored. 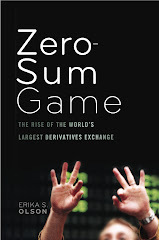 However, we cannot ignore that Pierre thinks that his fate can be changed, and that he is encouraging Future Dharma members to try and save him. And we can't be certain that they won't in fact try to do just that. 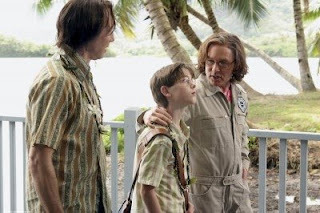 But if, as Ms. Hawking explained to Desmond back in "Flashes Before Your Eyes," the universe will always course-correct... then there seems to be no hope for Pierre, his poor arm and the rest of the Dharma Initiative. Maybe Future Dharma DOES travel back in time but is still unable to change Original Dharma's fate. ... I would bet that's what's going to happen. Why else would The Powers That Be behind the show have chosen to create "Octagon Global Recruiting" to try and attract people to the newly reconstituted Dharma Initiative (complete with a shiny new logo!)? Why else would this summer's new online game related to the show (or ARG, alternate reality game) revolve around Dharma? You can play the game at DharmaWantsYou.com... or you can be lazy like me and just read what other people figure out from the game here. 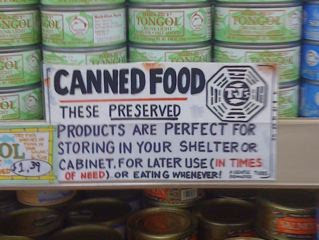 It would seem that the Dharma Initiative HAS been resurrected in the year 2008, and I wouldn't be surprised if they try to interfere with the past. The question is... is Widmore behind it all? I would guess that there would be some connection to him, too. Here's how it all might work: We can assume that Jack spirals into his depression in the late fall of 2007, because when he was still sober, happy, and living with Kate and Aaron, he read a clip about the Red Sox which placed the date at the end of August 2007. 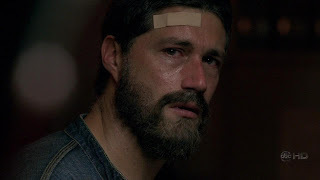 I would assume it would take at least a few months for him to get to the bad state he was in when he was begging Kate to return to the Island with him in the scene outside the airport in the Season Three finale. 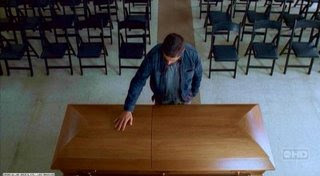 We can therefore assume that the final scene of Season Four, in the Hoffs-Drawler funeral home with Ben and Jack looking at Locke (sniff) in the coffin, took place in the final months of 2007. And what's after 2007? 2008. Our current year, in which Dharma is reassembling and Jack is trying to round up the Oceanic Six again; both groups would have the goal of getting back to the Island. It might take them some time... like, say, until the beginning of 2009. You know, right when Season Five premieres. I'm making a bet right now that all of the action in the show ends "real-time" in May of 2010, when the final episode of the series airs. Let us just pause a moment and appreciate the brilliance of the Lost writers once again, shall we? Anyway, last time we saw Sun, she appeared to be trying to strike a deal with Widmore. She could be trying to get revenge on Ben (whom she might blame for Jin's death if she learned, from Locke/Bentham that Ben let Keamy die, thus blowing up the freighter...), OR she could have hope that Jin is still alive (also from Locke/Bentham) and is using Widmore to help the O6 find the Island again. Especially if she learned that Dharma was re-forming and Widmore was backing their new mission. What Sun is up to is one of the things I'm most anxious to figure out next year. Let me restate that this entire section is just what I think is going on/going to happen ... purely my own theory. I'm sure it will be blown to bits shortly. YOU LOOK JUST LIKE ME, DUDE! At Comic-Con, there was a guy who looked EXACTLY like Hurley, as you can probably see from the still clip below. If you don't want to be spoiled about any Season Five plot points, only play the video for a few seconds just to appreciate his Hurly-ness. - Sawyer's going to be in a movie! - What's this? 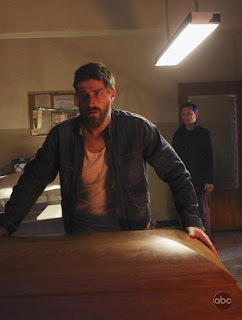 Locke and Chang have already met?!?! This throws all of our theories out of the window. Oh, wait. It was only on the show JAG. Phew. - Shout-out to reader LH for telling me about an appearance by Keamy and Zeke in Wild Hogs at 23-second mark in the video below. Yes, that IS Keamy. They both have been in tons of movies, by the way. Check out IMDB for the full list (here's Zeke's, here's Keamy's). - We had a guy do some work on our condo building last week, and I swear to you, he looked like he could be Desmond's uncle. I am sure the way I kept staring was unnerving the heck out of him. 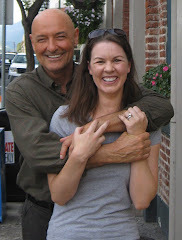 If he had busted out with a Scottish accent, I might have kidnapped him. Unfortunately I didn't get a picture (that probably would've made him walk out on the job, don't you think?). - If you've been reading 'According to e,' then you know that I saw a Sawyer look-alike at a Jimmy Buffett concert a few weeks ago. And Jimmy himself referenced Lost during his performance! - Before there was Lost, there was The X-Files to keep all of us nerds happy. Click here if you were a fan of that show and want to see some ultra-ridiculous pictures of me from an X-Files convention in 1998. That's all I've got! I'm going to be pretty busy over the next few months (be sure to check in to 'According to e' to keep up with my adventures and to catch a big announcement I'll be making in a couple of weeks...), so I don't think I'll post again on Lost for a while. Remember to sign up in the upper right-hand part of this site if you'd like to get any new posts emailed to you or fed into a reader. Or friend me on Facebook, where I also post any new write-ups. In the meantime, continue to do all that you can to keep your mind off of Lost's absence, and let me know if you have any other theories, questions or comments about the newest video! Posted by Erika (aka "e") at 4:22 PM 27 comment(s) from my peeps!